There are about five main types of aerial work platforms in existence. Each are designed for different applications with different strengths. The knuckle boom lift is one of these, and is built to be extremely versatile and flexible for worksites. Learn exactly what makes a knuckle boom lift and knuckle boom lift and what types of jobs it’s used for to help all kinds of worksites. Also called an articulating boom lift or an articulated boom lift, a knuckle boom lift is a type of aerial work platform that’s made with an extended boom arm and a platform for workers to stand and perform tasks at height. They are called a knuckle boom lift because the boom arm is jointed and able to bend. This resembles the bendable knuckle of a finger. The special design is what gives knuckle lifts their unmatched versatility. Knuckle boom lifts are also made with swiveling turntables at the base, allowing them to swing and shift to different areas of a worksite, making small adjustments to the position of the platform. Brands that manufacture knuckle boom lifts include Snorkel, Genie, JLG, NiftyLift, Teupen, MEC, and Haulotte Group. What Types of Jobs is a Knuckle Boom Lift Used for? Knuckle lifts are often used for maintenance work and other tasks that are difficult for workers and other types of lifts to access. Getting to semi-hidden ductwork and other structures high up on a building may only be accessible for those in an articulated lift that can be lifted and positioned right in front of the tricky work area. Wherever there are jobs involving exterior electrical work, piping work, and work that is hard to reach and needs maintenance or cleaning, a knuckle boom lift can be found. 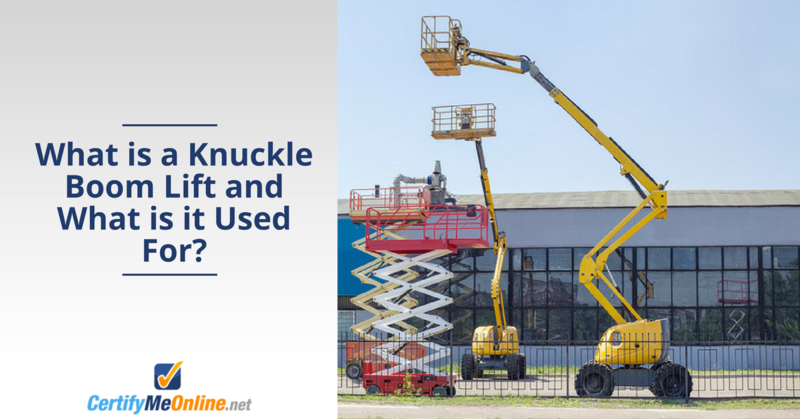 What Makes a Knuckle Boom Lift Different from Other Lifts? Other types of aerial work platforms, like cherry pickers, telescopic boom lifts and scissor lifts aren’t designed with the jointed boom arm. The biggest difference you can see between these types of lifts is that a knuckle boom lift will have a bend towards the middle of the boom arm. Cherry pickers, bucket trucks, and telescopic boom lifts are made with extended boom arms that can reach various heights both vertically and horizontally, but cannot reach up and over structures. Scissor lifts are even less versatile and must be positioned directly under the work area because they only raise up and down directly above the base. Why Would You Choose a Knuckle Boom Lift? – The work area is in a confined area. Knuckle boom lifts are specially designed for working in tight and confined areas because they can reach up and over obstacles and their small base can fit within congested areas. – You need to reach over obstacles and structures. Knuckle boom lifts have less horizontal reach power than other lifts, particularly telescopic lifts, but they are made with better versatility to reach up, over and out to access work areas. – The work area is indoors. There are many models of knuckle boom lifts that are electric, do not emit toxic fumes, and are fitted with non-marking tires for indoor use. – The work area involves outdoor rugged terrain. Rough-terrain articulating boom lifts can handle uneven terrain outdoors. – Your work requires extra reach from the platform. Some knuckle lift models are made with a boom extension, also called a jib, that is designed for adding another articulated point that moves the platform up and down. Do I Need Knuckle Boom Lift Training? As you’ve learned in this article, not all aerial work platforms are made the same. Each is made with its own unique capabilities. The knuckle boom lift is no exception and requires that operators get specific training to ensure they are able to use the equipment properly and safely. Knuckle boom lift training teaches operators exactly how to use a knuckle lift, handle the different capabilities, inspect the equipment prior to each shift, and assess the surrounding environment for any hazards. Without training, workers aren’t prepared to operate the special workings of a knuckle lift and spot any hazards that are specific to working with articulated lifts, like tight working conditions. If you’re an operator and would like to start working with articulated lifts, or you’re an employer and need to train your employees in knuckle boom lift operation, look no further than CertifyMeOnline.net. Our online training classes are easy, convenient and affordable, and comply with all OSHA regulations. Knuckle boom lift training is the most effective tool for reducing accidents involving knuckle lifts. Inside our classes, operators will learn everything they need to operate knuckle lifts, inspect the equipment, and recognize and avoid the hazards that can lead to injuries and fatalities. With a total cost of $299 for the entire training kit, there’s no reason to skip this crucial part of operator and knuckle boom lift safety.